Additional research shows that there could be other benefits such as lowering the level of serum cortisol. This particular hormone is secreted by the adrenal glands and is responsible for our response to stress. It helps regulate blood pressure and helps with sugar levels. Basil can also boost the activity of some white blood cells. Specifically neutrophils which are a type of white blood cell that fight off acute viral infections. When you get a cold, neutrophils generally rise in production to help fight off the virus. Excess stress can reduct neutrophil counts. This could be why the herb has been shown to have both anti-viral and anti-bacterial properties. Believe it or not, this herb can help fight off ringworm. Basil has anti-fungal properties when applied topically. You can find Basil oil here. The health benefits of Basil herb are due to the miriad of vitamins, nutrients, flavonoids and antioxidants present. Basil one of the most popular cooking herbs and can also be used as an essential oil. It is an aromatic, versatile, easy to grow, culinary herb common to many cultural types of cooking including Italian, French, Thai and Vietnamese. Basil varieties encompass lemmon, anise cinnamon and sweet. Basil is usually chopped when added to items such as salad, but is is also added to hot dishes. The leaves will wilt very fast and at that point can be made into a Pesto sauce with olive oil and garlic. 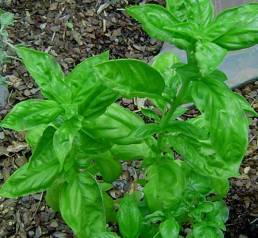 Basil is found in many gardens and grows best in warm, dry climates. It does flower and the blooms produce all summer long. By cutting the buds off before full flower you will get more leaves and the plant will become bushy. Although fantastic in cooking when fresh, it can be harvested in the fall and dried. There are many components of Basil that are responsible for the healing benefits. Flavonoids:rich in flavonoids, which come from flavones or tricyclic aromatic compounds. Two major flavonoids present in Basil are orientin and vicein, both of which protect cells and chromosomes from radiation damage. Nutrients: This herb has plenty of Vitamin A and C in addition oth other anti-oxidants. These compounds are responsible for scavaging free radicals that result in cellular death, which results in premature aging, cancer and other disease. Additionally, basil has iron, calcium, magnesium and some pottasium. Antibiotic properties: The volitale oils in basil such as estrogole, cinole, myrcene, eugenol and limonen are responsible for anti-biotic properties. It is effective against Staph. aureus, Enterococcus sp.,E. coli, and even Pseudomonas aeuroginosa. This is important as many of today's antibiotics have decreased efficacy due to bacterial resistence against the drugs. The essential oils of Basil oil are best used topically to fight skin infections. Eugenol is a COX (cyclooxygenase) inhibitor. This is the same enzyme blocked by many anti-inflammatories such as naprosyn. This makes is a good choice for arthritic diseases. It can help with other skin disorders such as acne. It is also useful for eczema and may help psoriasis. Another benefit of basil is that it decreases cholesterol levels thereby promoting heart health. The magnesium in the herb is a smooth muscle relaxant which can help with GI health. When infused as a tea, it relieves constipation, GI cramps, indigestion and nausea. As an herb, Basil is impressive with all the benefits it has to offer. It is an anti-inflammatory in addition to being and anti-biotic, lowers cholesterol and soothes skin irritations. It is also very popular as a culiary herb. Generally, basil herb is completely safe, both for children and the elderly. There is thought to be a link that exists between taking the herb and lowered fertility. Those that are trying to conceive should only take it with care. Basil Herb is a great herb that can certainly help with the treatment of several ailments, including some that are chronic. It has been in use for thousands of years in some areas of the world and will continue to be so for many years to come.